Posted by Elizabeth Fais in Giveaway, Winner! Tosses copious mounts of confetti! I’ll email you to get an address where I can mail the book. 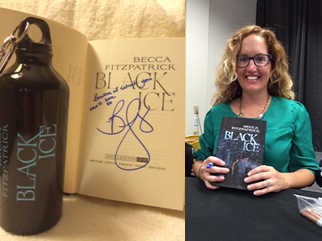 “BLACK ICE” by Becca Fitzpatrick ~ Author Signed Giveaway! 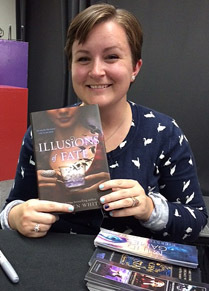 Honesty Hour: I got this book last Fall when Becca Fitzpatrick visited Kepler’s Books in Menlo Park, CA. It took me this long to read it, because psychological thrillers scare me more than anything else. That’s because they’re so real. NOTE: The FREE giveaway of an author copy of this book is open to residents of the United States only, due to shipping costs. My sincere apologies. Leave a comment on this blog–explaining WHY you’d love to read this book– by midnight Friday, February 27th (1 entry). 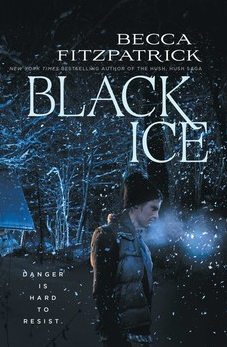 Tweet about this giveaway, using #BlackIceGiveaway in your tweet (1 entry). I’ll tally the entries and pick a winner that I’ll announce on this blog Sunday, March 1st. 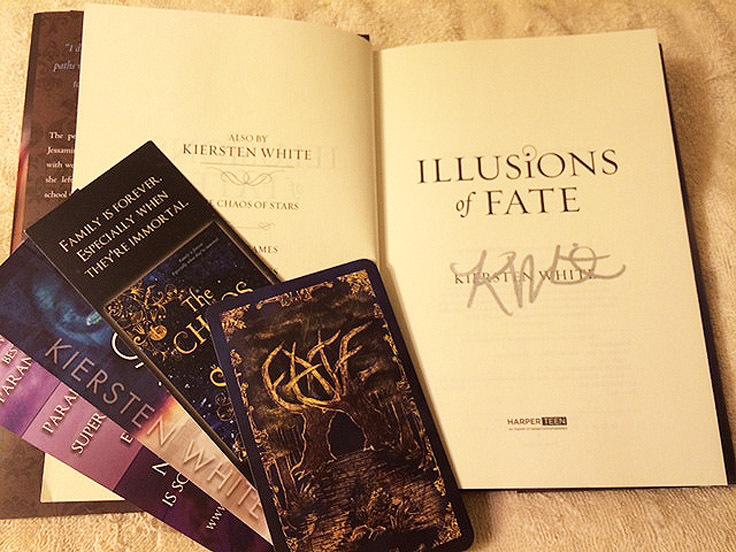 “Illusions of Fate” by Kiersten White ~ Author Signed Copy GIVEAWAY! The people of Albion are different from anyone Jessamin has ever known: harsh, upright, and obsessed with wealth and rank. Jessamin knew as much when she left her sun-drenched island home to attend school in their gray, dreary country. But she had no idea how different they truly were. She never thought she would discover a house with door that open onto a hundred corners of the city or a book that spends its days as a bird. She certainly never expected to become a pawn in a political and magical power struggle between the sinister Lord Downpike and the handsome, charming Finn Ackerly. And she never so much as imagined she’d win Finn’s affections—or that one day his shadow would follow her every step. If I had stayed on the thoroughfare that day, not taken the alley, I would never have met him. … I sit, defeated, and shuffle the cards for the hundredth time. I cut the deck, close my eyes, and draw a card at random. FATE. I always draw fate. Jessamin swept me into her fictional 19th century world and immediately won me over with her sharp wit and strength of character. At the age of sixteen she left her tropical island home for a distant country, so she could better herself with an education she helped earn working as a servant in a hotel. Jessamin’s meager finances put her at the bottom of Albion’s high-society caste. To make matters worse, her darker skin label her as a foreigner, making her even more of an outcast. Jessamin works hard to be the best in her classes,and getting little recognition. Still, she’s proud of holding her own. That is, until the fateful day Albion’s magical forces catch her up in their vicious snare. Strong spirited Jessamin fights back, battling her wits against evil magic, proving her island moxie is something to be reckoned with. 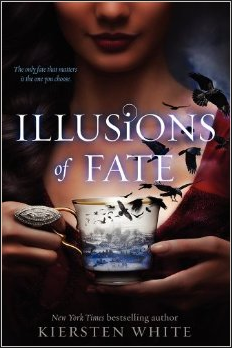 ILLUSIONS OF FATE is flat-out fun–Witty dialog and scenes crafted with style and polished prose. I highly recommend this beguiling story to any young adult, or adult who is young at heart. Jessamin’s wit and fortitude gave me a heroine I could laugh with, root for, and admire. Jessamin is ordinary, not ‘the chose one’, so it’s easy to empathize with her. Even though she has meager funds on which survive, Jessamin isn’t swayed by money and power. She knows her mind and sticks to her morals. Lord Ackerly is wealthy, powerful, and of high social standing. He’s adept in casual social situations, but nervous when it comes to personal relationships of depth. His flaws make him vulnerable, and I couldn’t help hoping Jessamin would give him a chance. The 19th century fantasy world has a steampunk patina that gives the setting depth, and brings the world to life. Quirky secondary characters, such as Sir Bird and Eleanor, add humor and give depth to Jessamin’s character. I don’t want to ruin it for you, but I didn’t see the ending coming. Better still, after the last twist was revealed, I was satisfied with the outcome because it was more than earned. Leave a comment on this blog–explaining WHY you’d love to read this book– by midnight, November 20th (1 entry). Tweet about this giveaway, using #IOFGiveaway in your tweet (1 entry). I’ll put all *entries* in a hat and pick a winner blindfolded. I’ll announce the winner on this blog Saturday, November 22nd. May Fate be with you!